Get customized Travel Agents Email List, Tourism Companies Mailing List, Travel Agents Email Address List and Travel Agencies Telemarketing list to reach your targeted Travel and Tourism Industry Executives and decision makers in the USA, Canada, UK, Australia, Middle East, South Africa and Asia. Travel & Tourism industry has contributed about US$7.2 trillion to the world GDP in 2015, which represents 9.8% of the global GDP. Growing at a rate of 3.1% year on year, the sector looks promising for all those associated to it. For marketers to make the most of this growth, Blue Mail Media provides one of the most updated and qualitative Travel and Tourism Mailing list. Our database is designed to give your multi-channel marketing initiatives the much needed boost. It also enables you to access complete marketing information to reach your prospects via telephone, email or mail. Blue Mail Media has been a known name among the qualitative marketing data seekers all over the world. 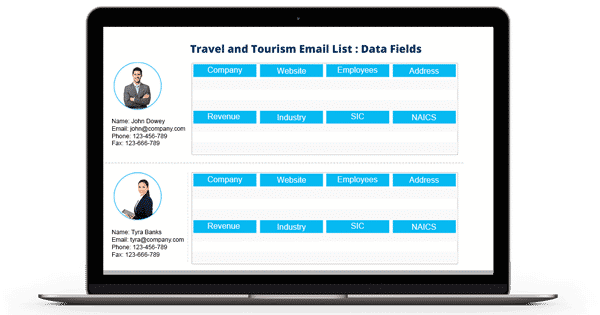 We put immense hardships in making our Travel and Tourism Email Database competent enough to help you gain significant traction in your marketing campaigns. Our team collects data from all the authentic sources, makes thousands of verification calls and sends verification emails every day, and constantly updates the data to ensure its accuracy and reliability. Blue Mail Media strongly believes that each business has unique needs, and thus, we provide you with pre-packaged Travel Agency Email List as well as customized list based on your specific requirements. Blue Mail Media has built a strong data partners network across North America, Europe, ASIA, Australia, New Zealand, Africa, Middle East and South America, which enables us to help clients globally, yet with a local touch. Also, we house a strong team of data professionals, experts, and analysts who constantly keep our Travel Agents Email Database updated and free of errors. We equate our success with the success of our clients and go an extra mile to make sure our clients realize measurable success in their marketing initiatives. 1. How accurate and reliable is your Travel and Tourism Industry Email List? - Our Travel and Tourism Industry Email List is highly precise and trustworthy. It has 85-90% of accurateness and more than 90% of deliverability rate. Our team performs strict quality checks and updates the list every 90 days. 2. Do you provide customized Travel and Tourism Email Lists? 3. Can I target the global market using your Travel and Tourism Industry Mailing List? - Yes. You can quickly target the organizations worldwide using our Travel and Tourism Industry Mailing List. You can reach all the decision makers and executives in various regions, including the US, the UK, North America, Canada, Europe, Australia, Middle East, South Africa, Asia, and many more. 4. Which data source do you use for the Travel Agent Email List? - We have an expert team of specialists who are responsible for collecting the data from highly authentic and internationally trusted sources such as government records, yellow pages, corporate websites, surveys, B2B directories, job listings, trade exhibitions, conferences, magazines, business meetings, and other. 5. What data do you provide in your Travel and Tourism Industry Email Database? - We offer you access to all the essential B2B marketing information of your prospects in our Travel and Tourism Industry Email List. The data includes- first name, last name, company name, job title, revenue, company size, phone number, geographical location, fax, web address, SIC code, NAICS code, and more. 6. Does your Travel and Tourism Email Lists comply with GDPR and Anti-Spam law? - Yes. Our Travel and Tourism Industry Email List thoroughly follow all the guiding principles of GDPR and Anti-Spam law. 7. In which format will you provide your Travel and Tourism Industry Mailing List? - Our Travel and Tourism Industry Email List will be sent to you in Microsoft Excel format through email.